Postal Service employees deliver billions of mail items each day and providing the service to all Americans. Related skills and abilities are needed to provide this service. Checking addresses, sorting, and delivering mail are essential to move big volume of mail quickly and accurately. The Postal exam 473 identifies individuals with the right job-related experience, abilities, and personal characteristics. Our our free USPS 473 sample PDF contains simulated questions of the 473 exam. We have included some sample questions below to help get a better idea of the questions and answers which are included in our PDF guide and real test. What is included in the Postal Service Exam 473? proceed to another part of the test or return to a part of the test you previously completed. What parts are included in the Postal Exam? A Address Checking 60 11 Min Determine whether two addresses are the same. B Forms Completion 30 15 Min Identify information for correctly completing forms. C Section 1 — Coding 36 6 Min Identify the correct code to assign for an address. C Section 2 — Memory 36 7 Min Memorize codes to be assigned to a range of addresses. D Personal Characteristics and Experience Inventory 236 90 Min Tendencies toward job-related characteristics and experience. Compare the address and zip code given to the correct address and zip code and determine what error, if any, is present. What is the qualifying Postal 473 score? You will need a minimum score of 70. The acceptable test scores basic rating ranges from 70 to 100. Veterans’ Preference Act of 1944 requirements may add points to the basic rating. Mr. Green would like to pick up his mail on January 12, 2019. Where would he indicate that with a check mark? 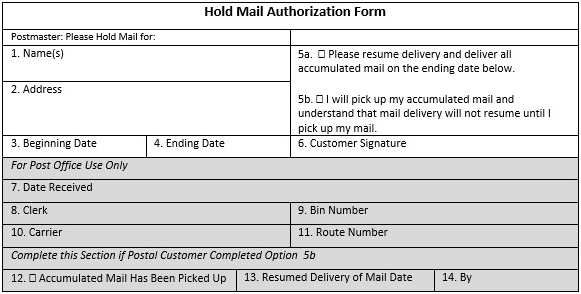 Box 5b indicates that the customer would like to pick up her mail when she returns. A passing score on the Postal test qualifies you to continue in the hiring process but does not guarantee employment with the Postal Service. If you qualify, you will be listed on an entrance register — a resource to help us consider applicants for vacant positions. Your name appears on the register with other applicants who passed the test. Disabled veterans with passing scores are listed at the top of the register ahead of other applicants who passed the exam by law. ■ What is the Delivery Route code for: 2585 Glenshaw St.? ■ What is the Delivery Route code for: 1635 55th St.? How Can I Land a Job at Chesterfield Yarn Mills?